Today's edition of GRUB! is a bit of a subversion of the form. The intention of the series has always been to introduce non-UK readers to food and drink that is particular to this place and, by extension, to let UK readers know that some of the foods they take for granted are, in fact, unique and rather special. That's why today's blog isn't quite in the spirit of the thing because pretty much everyone has cheese. (Even Nepal, where they make it out of yak's milk.) Nonetheless, I'm going to forge ahead with the cheese blog for two reasons. First, this was a rather special cheese occasion, and second, cheese is, well, it's CHEESE, which is of course an inherently Good Thing and worthy of attention and celebration at any time. So… Cheese Night in Richmond. I knew I was on to a winner when I saw this article in the Guardian: "Cheese master brings tasters to Richmond". I quickly fired off an email to my friend Jeremy, who will be remembered by astute GSWPL readers as the one responsible for my recent foray into the world of Premier League football. He and I have done fun foodie kind of stuff before - in particular an excellent beer and food pairing dinner celebrating the many and varied tastes of India Pale Ale - so I figured he'd be up for it. This was way back in November, so it's a testament to the enduring popularity of cheese that the first of these monthly cheese events we could get in to was last Thursday. Tony, holding forth on his specialist subject. One of the reasons that it was so hard to get a spot in one of these classes is that the Richmond branch of The Teddington Cheese is decidedly on the petite side, meaning that once ten folding bar stools are set up there's just enough room to pass round a bottle of wine, but only if it's not a magnum and if you keep your elbows down. This made for a cozy atmosphere that was most appreciated because it was a cold night, one in a long line of cold nights that have plagued the island for what seems like eternity (Yes, I know I'm whinging about the cold when most of Canada is still shovelling the sidewalk. I have no defense. I've become soft. Let's move on.) Cozier still was the fact that Tony handed around glasses of a nice white wine before we got down to cheesy business. 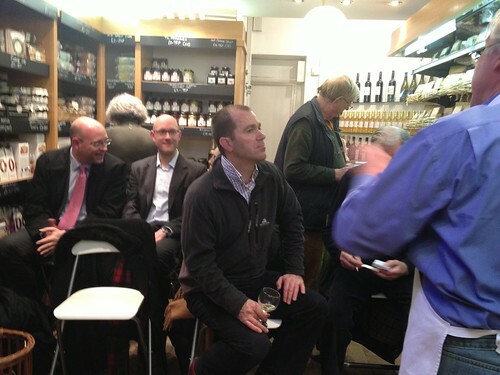 The packed confines of The Teddington Cheese with Jeremy in the foreground, apparently frozen in laser-like concentration while the rest of the shop is a blur. Tony started us off with the basics - the different kinds of milk commonly used to make cheese. 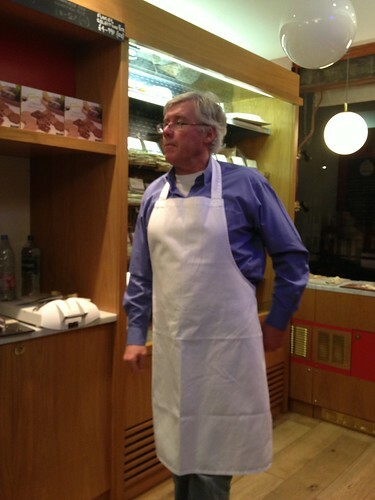 We tasted cheese made from cow's milk, ewe's milk and goat milk, and Tony gave a nod to buffalo mozzarella as well. (Aside: I honestly did not think that buffalo mozzarella was made from actual buffalo milk because... BUFFALO MILK? What the hell? How would it occur to someone to milk a freakin' buffalo in the first place? And if seized with the notion, exactly how does one go about milking a buffalo? The mind reels. The notion that buffalo mozzarella is made from actual buffalo product is a bit like thinking one might order a pizza topped with salami that turns out to be made from alligator meat. In fact, I still have a sneaking suspicion that it's all an elaborate hoax, akin to the great Spaghetti Harvest BBC report of 1957.) My ranting suspicions aside, the tasting was good, and much like you'd expect. For each cheese Tony had a generous slice on a little platter which he chopped into small pieces and handed around to the group. No poncey biscuits or toast to get in the way, just cheese cheese cheese. We sniffed and tasted and Tony told us things we might notice and it was all quite nice. The pieces were small, but we were warned that we'd regret anything bigger by the end of the night. After talking about the different types of milk, we moved on to a study of the effects age on cheese with a vertical tasting of three different gruyeres that ended with a four year old version that was understandably powerful and excellent. Naturally, older cheese are firmer and drier as a result of the weight of moisture lost in ageing, which I like to think of as the cheese equivalent of the Angel's Share. No one was surprised that the older the cheese, the stronger the flavour. What did surprise me was to learn that the maximum age a cheese can get to before it turns is about five years, and that only applies to the hard cheeses. Softer cheese go off much quicker and that buffalo mozzarella is only good for five days. And I was proud to learn that the oldest cheese Tony had ever tasted was a five year old Canadian cheddar, which earned favourable reviews. I also learned a new word: affineur, which is "a person whose specialty is maturing and ripening cheeses." Cheesemakers will often send their cheeses to an affineur for storage and ripening, and the affineur will be responsible for monitoring the cheese, turning it if necessary, and tasting it periodically in order to determine the perfect time to consume it. Clearly this profession was not on the guidance counseler's list when I was in high school because if I'd have know one could earn a living eating cheese then the theatre world would surely have lost one of its brightest technical management stars. After age, we turned to a study of the effects of size on the flavour of cheese, demonstrated by tastes of a nice Petit Langres, followed immediately by its larger cousin, the (just plain) Langres. I was surprised that the larger cheese had more flavour, expecting that whatever magic mojo happens to make cheese be cheesier would act more quickly and emphatically in a small cheese. Nope. Petit Langres. 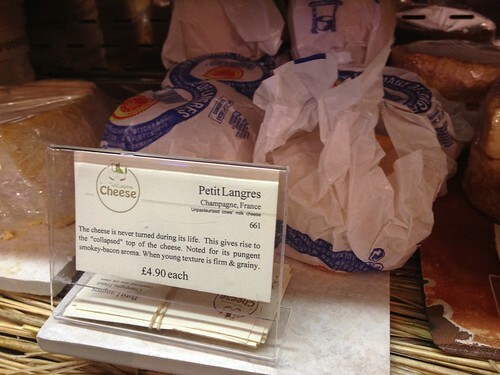 Every cheese in the shop (and there are about 140) comes with a little card telling you a few fun facts. When we moved on to blue cheese Tony switched us to the red wine and I was starting to become grateful that I hadn't had any dinner. Being a fan of blue cheeses in general, there were a couple in this round of tasting that I'd seek out again, including a fantastic strong Vieux Berger Roquefort and a lovely mild one called Devon Blue that won a gold medal in the 2011 British Cheese Awards. (My invitation to that event must have got lost in the post. Damnit.) Then it was on to the washed rind cheeses, including a lovely one called Oxford Isis that tastes like grown-up Laughing Cow cheese. Then it was the white rinds, the most familiar of which is Brie, and by this time even I getting slightly over-cheesed. Tony had hit his stride though, and held forth on the notion of rinds in general, and the utterly unsatisfactory use of wax to seal a cheese as opposed to a proper naturally formed rind which is normally created by washing the outside of the cheese in brine or other other things that add flavour. The whimsically named Stinking Bishop cheese is washed in perry, a pear cider made from the Stinking Bishop pear. And the aforementioned Oxford Isis is washed in honey mead. As for wax? Here's Tony's pronouncement: "Avoid it like the plague. It does nothing for the cheese." In a final attempt at mass death-by-cheese, Tony presented us with his favourite wine and cheese pairing by pouring out some ridiculously large glasses of the sweet dessert wine Sauternes and presenting it with a wicked Crozier Blue cheese which seemed counter-intuitive but demonstrated that Tony is clearly a cheese savant because it was great. And I'm sure that had nothing to do with the fact that we were all somewhere along the continuum between tipsy and sloshed by that time. Alongside the wine and cheese we got tidbits of cheese trivia, such as the unsurprising fact that 80% of the cheese sold in the UK is sold through supermarkets, and 80% of that is cheddar, which is sort of sad. Also, it turns out that Teddington cheese goes through about ten metric tonnes of cheese each Christmas, including a full ton of Stilton, that single tonne of which is equivalent to about a four foot by four foot by four foot cube of solid cheese. Tony also tackled the thorny subject of pasteurisation. His position is that unpasteurised cheese is a minimal risk - the acid and salt in the cheese, along with cool storage temperatures make it difficult for nasty bugs to survive. Though interestingly, most blue cheeses are made with pasteurised milk because the cheesemakers prefer to restrict the bugs that go into those cheeses to the ones they put there themselves. Along with the obvious (cheese, cheese and more cheese) Teddington Cheese also stocks an extensive range of chutneys which Tony was amusingly dismissive about, declaring "Chutney is an awful thing to do to a nice cheese." Even better, one of the shop's specialties is the Cheese Wedding Cake. This is certainly not anything to do with the graham-crust, strawberry-topped variety of cheesecake (all one word). Oh no. 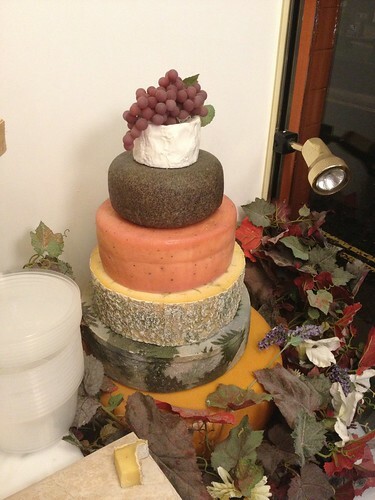 A Teddington Cheese Wedding Cake is a multi-tiered edifice constructed entirely of whole wheels of cheese. This is a notion so beguiling that I've decided that the next time I meet a man I've got vague romantic notions about my first question will be, "If we were to get married, would you have any objections to the notion of a wedding cake made entirely of CHEESE?" If the answer is no, he's not even going to get out of the starting gate. An example of the cheese wedding cake. When you order one you get to spend a bunch of time tasting different cheese deciding exactly what you want in your cake. And sometimes they separate the layers by adding pillars of those tiny goat's cheeses in between. Genius. 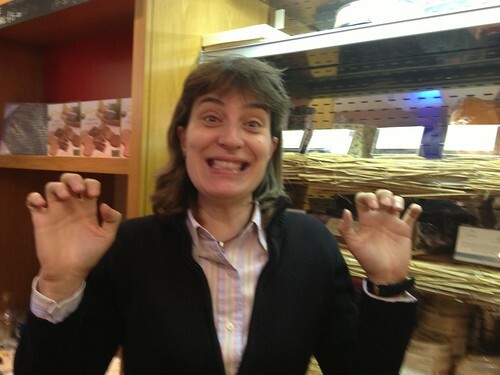 By the end of the night it really was time for home, though not before a mandatory photo op of me in the cheese shop doing my best Wallace and Gromit cheese fingers. And on that note, it's clearly time to close off before things degenerate any further. Beside that, I've got to tend to the nice bit of Oxford Isis I purchased at Brixton Market this afternoon. Please excuse me. I like to think of myself as a bit of an aficionado of walking tours. I did spend a year as a full-time traveller, and now live as a weekend tourist in one of the greatest cities in the world, so I really have trod more than my share of miles attempting to keep up with tour guides from Belfast to Beijing. 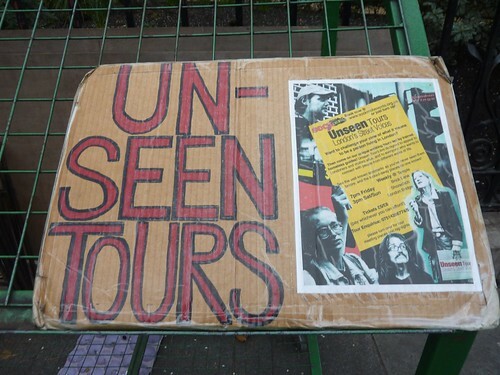 But last week I did a walk like no other, run by a company called Unseen Tours. Their guides do not hold the coveted blue badge sported by so many professional tour guides in London. In fact, Unseen Tour guides aren't professionals at all. That's because Unseen Tours are guided by people who have an unusual perspective on the city, because they're homeless, or recently homeless, or "vulnerably housed." The homemade sign marking the start point of an Unseen Tour. Most of the £10 fee for the tours stays with the individual guides, who are coached for months by Sock Mob volunteers before being deemed ready to guide the general public. There are currently five different tours offered, at London Bridge, Shoreditch, Covent Garden, Brick Lane and Brixton. Even though the Brixton tour was right in my back yard, I decided to head to Covent Garden. Maybe because it's easy to have a tourism-driven, romanticised "Eliza Doolittle" idea of the area, I thought that learning about it from such a different perspective would be really interesting. And I wasn't wrong. It was a cold day last Sunday. Not Winnipeg cold, but damp and chilly enough that I elected to wear long underwear and a toque and a lot of layers. It was the kind of day that made it clear what a brutal thing it must be to sleep rough through a London winter. My tour started at Temple tube station, tucked in along the Embankment at Waterloo Bridge. I showed up a few minutes early and found my guide, Viv, who's originally from Norway, but has been a Londoner since 1975. Maybe it was because it was a cold and rainy day, or maybe because the tube station was closed, but whatever the reason I was the only one who'd shown up for the tour that day. Viv didn't seem bothered by this, so she took my £10 and we set out on my personal guided tour of unseen areas around Covent Garden. We started in the small gated park right next to the station, and Viv gave me an unexpectedly scholarly rundown of the history of the name "Temple" which is apparently derives from the knights Templar, they of the crusades. (She's something of an expert on the Crusades). These days the nearby Middle and Inner Temples are two of the four Inns of Court, which are the professional associations for barristers in England and Wales. Then, in the kind of left turn that would soon became familiar, she pointed over to one of the wooden benches in the park and said, "I used to sleep there." Needless to say, this is not the kind of comment I've ever had from a tour guide before. It was these kind of things that made the tour for me. Viv was really open about her past, and talked about when she and her partner were part of a small community of people who slept in that park in Temple in 1999. Apparently it's a coveted spot (not least because a charity hands out food across the street every night). There are benches to get you up off the ground, and its completely fenced in so once the gates are locked at night there's a measure of safety that's not available in more open areas. She even told me about a set-up she had that involved borrowing crates from a nearby fruit and vegetable stall outside the tube station and setting them up like a mattress, covered in layers of newspaper, with a sleeping bag and a tarp over top. It was, relatively speaking, a good arrangement, though also a lot of work because the crates had to be returned to the stall before the stall-holder arrived in the morning, and the other bits had to be dismantled and hidden in the park during the day so the cleaners wouldn't toss them out. Anyone who believes the homeless are lazy might have a think about the effort involved in keeping body and soul together with no fixed address. Viv says there are about 4,000 people who sleep rough in London every night, though that number goes up in the summer. And I suppose its not surprising to learn that the homeless community is, well, just that: a community. People tend to know each other, or know of each other. Small groups like Viv's gang in the park at Temple form and stick together for a time, regulating who is and who isn't let in, based on word of mouth and personal recommendations. When she was sleeping in that park, Viv knew each person on the other benches. After the park, we moved off past one of the few remaining cab shelters in London. 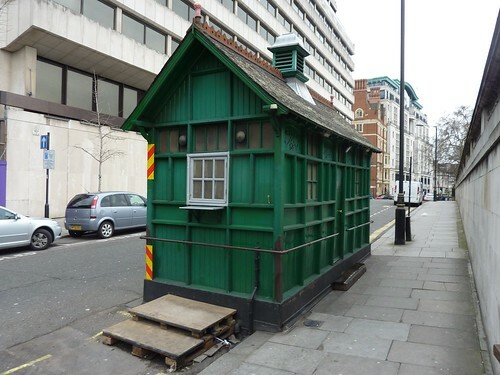 These distinctive tiny green huts were established to provide a place for the drivers of hansom cabs (and later motorised taxis) to shelter from bad weather and get a bit of hot food and drink. They were run as a benevolent service founded by the Earl of Shaftesbury in 1875 and intended, at least in part, to keep the drivers out of the pubs while on duty. At their height there were 61 shelters in London; 13 still survive and continue to serve food and drink. The cab shelter at Temple Place. Anyone can buy food from the stall, but the small number of seats inside are still reserved for cabbies only. Viv says you can get a cup of tea for 70 or 80p and a bacon roll for two quid. Not bad. As we moved along under Waterloo Bridge, we came to another important spot in the homeless geography of the area. The areas under bridges are generally popular because they're sheltered but publicly accessible, and this spot in particular was another of Viv's former homes. She'd had a "bash" on a platform area under Waterloo Bridge. As she explained, a "bash" is a temporary shelter made from found materials - tarps, tents, cardboard, shipping pallets, whatever. Having a bash is quite good, though even then you still have to be careful of theft and random violence. Viv talked about having to haul her bedding around all day to stop it getting nicked, which again shows that life on the streets requires a lot of effort. You can just see that someone's got a tent set up on the platform. 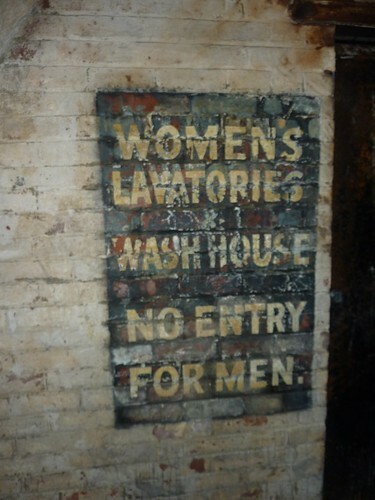 Apparently there even used to be a water tap, which was, as you can imagine, very helpful. 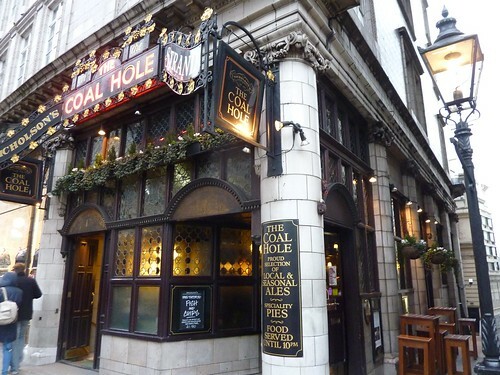 The Coal Hole. They do a decent ploughman's lunch. For Viv, The Coal Hole was once a regular haunt where she met an actor who was in a show at one of the nearby theatres. He used to sit at the tall tables outside and was friendly and chatty, often giving her a bit of money if he had some spare in his pocket. Only later did she find out her benefactor was Richard Harris, the actor who may be best-remembered as Dumbledore in the first two Harry Potter movies. 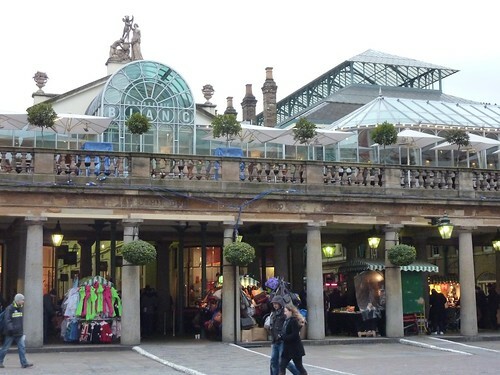 Eventually we made our way to Covent Garden Market, the tourist hot spot. Along the way Viv pointed out the people sleeping in doorways and explained they do that because its safer to sleep during the day so you can be awake and aware at night when it's most dangerous. The hours after the pubs close are particularly fraught and the homeless are often targets of verbal and physical abuse for drunk revellers. It's not unheard of for people to be kicked or spat on, and there have been cases of people being doused in lighter fluid with attempts made to set them alight. I'll say it again: it's a tough life. There's also violence within the homeless community. 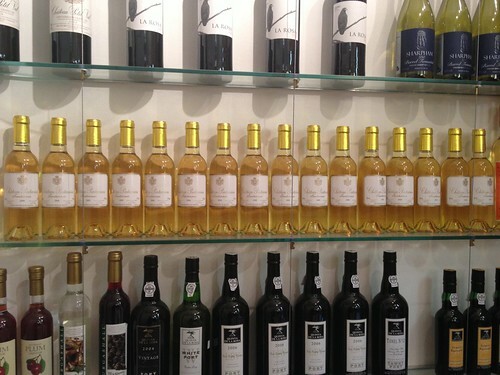 Alcoholism can be common, and wherever alcohol is abused (whether it's in a touristy Covent Garden pub or in a bash under Waterloo Bridge) hostility and violence often follow. 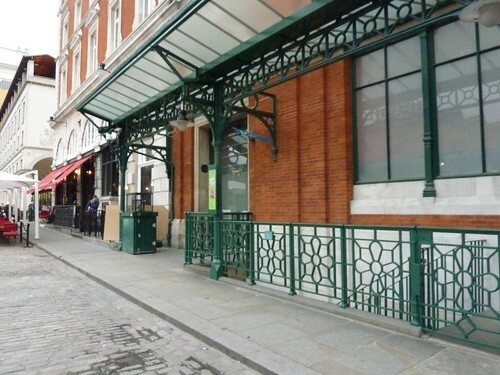 Covent Garden had a particularly personal landmark for Viv - the place she slept when she first became homeless. Near the Transport Museum there are several outdoor staircases that lead directly into the basements of the museum and surrounding buildings. I'd never noticed them before but one of them, in front of the newly-opened fancy "Balthazar" restaurant, was Viv's former haunt. In a particularly odd moment we found ourselves at the top of the gated stairs as a young woman arrived on her way down to what's now the staff entrance to the restaurant. Viv chirpily informed the girl that she used to sleep under these stairs, fifteen years ago. The girl's reply was to ask - and I'm not kidding - "This place was here fifteen years ago?" It was bizarre. How can someone living in London and possessing of even an iota of awareness of their surroundings estimate the age of a building in Covent Garden is younger than several shirts I own? 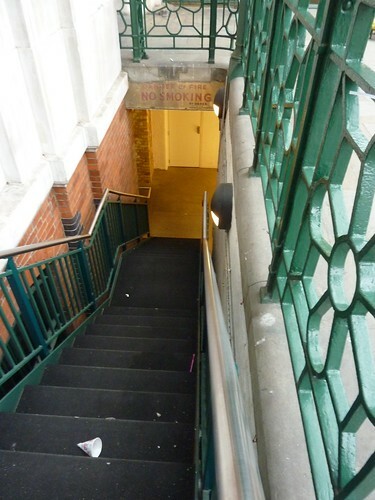 This kind of staircase used to be able to shelter 12-24 people every night, tucked out of the way, under cover, sometimes even near warm air vents. Relative luxury. Now they're inaccessible - walled off or fenced or locked up. 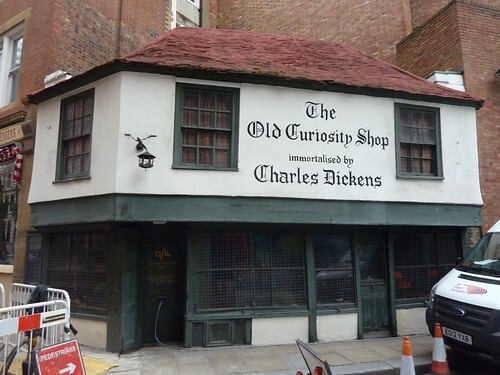 We then took a chilly wander past the Dickens Coffee House and the Theatre Royal Drury Lane. There's an interesting ghost there, one of the many who are said to inhabit this "most haunted" theatre in the West End. "The Man in Grey", as he's known, is supposedly only seen on the opening nights of shows that go on to a successful run, making him perhaps the most popular poltergeist in London. We also walked past this place, which I had no idea was there. 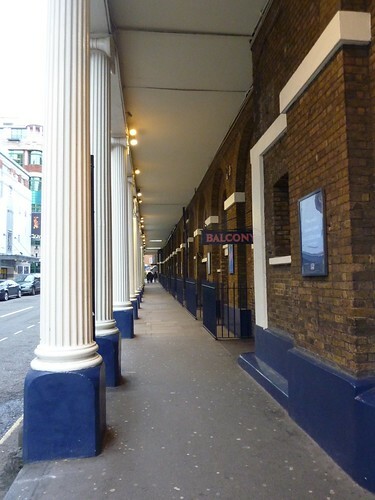 Eventually we ended up at a spot that turns out to be a landmark for homeless Londoners. 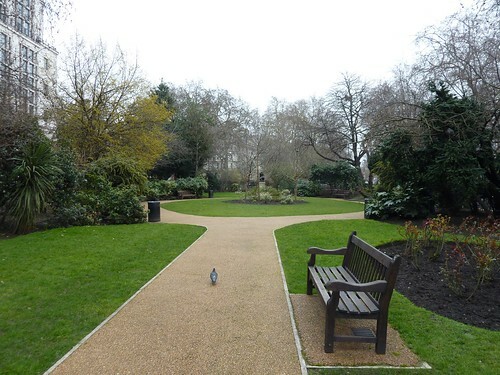 Lincoln's Inn Fields is the largest public square in London. Wikipedia notes that it was privately owned until 1895, but Viv's version of events is different. She told me that an old woman used to own the square, and bequeathed it to the homeless when she died. Local solicitor's firms launched a legal appeal about the bequest that was eventually upheld on the technicality that "the homeless" as a general group (as opposed to a particular, named, homeless person) were not eligible to inherit. "You won't find this on Google" said Viv, and indeed she's right. A few minutes online reveal nothing of Viv's version of events, but certainly its true that there was a large homeless community at Lincoln's Inn Fields in the 1980s. They were eventually cleared out in 1992, and fences were erected around the square and locked every night, but Lincoln's Inn Fields remains one of the only places in London where the homeless are fed every day of the year. I leave it to you to decide whose version you want to believe. 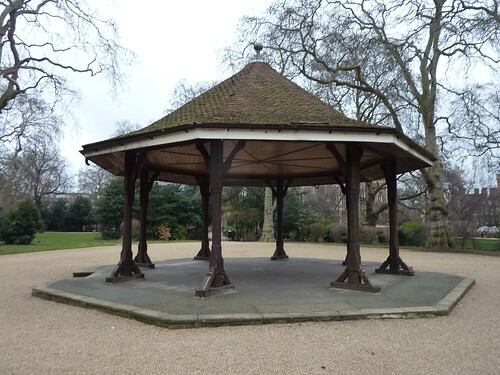 The gazebo now at the centre of Lincoln's Inn Fields. The tour ended at the square. By this time my fingers were stiff with cold and my feet were sore and I wanted nothing so much as a warm cup of coffee and a place to sit and thaw out. The Unseen Tours website suggests that patrons might want to invite their tour guides for a cup of coffee or a pint after the tour, I suppose to continue fostering personal relationships among the housed and the unhoused and to reduce the stigma associated with being homeless. I was getting ready to ask Viv if she wanted to join me for a cuppa (she really did have a lot of interesting stuff to say, I sensed she could have gone on for another two hours) but before I could offer she said she was off to catch a bus and was gone, leaving me to make my way to the tube and then back to my warm and friendly home in Brixton. I never asked Viv if she's still living on the street. Despite all the personal details she shared it seemed like it would be rude to pry about her current circumstances. So while I was safely tucked up with a cup of tea and my toes under a blanket in my room, I don't know where Viv ended up. But I do know she opened my eyes a little bit to a world that's always been on the periphery, and I'm glad she got my ten quid. There is something about corn here. Or, more specifically, about corn niblets. 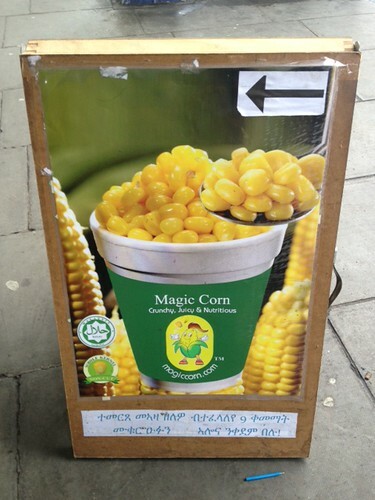 (Or "sweetcorn" as it is known here, probably to differentiate it from its close cousin, sourcorn. Actually probably because the term corn is sometimes used to refer to any kind of grain, but really I digress.) What I was saying is there's something about sweetcorn here, and that something is that often appears in odd places. (Not odd as in on the bus, or the sock department at Marks and Spencer, or the House of Lords, but still, you know, odd.) Some of you may be used to encountering corn in shepherd's pie, and that's common here. But what about in your cold lunch? Not difficult because it's basically impossible to get a tuna sandwich here without corn in it. 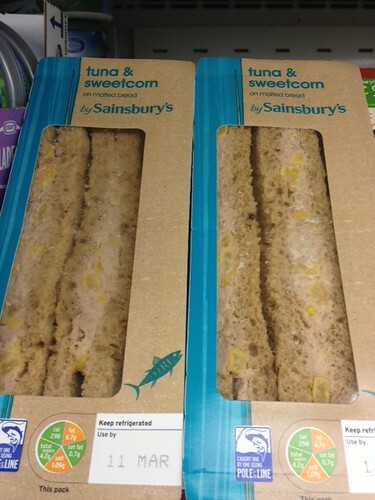 A tuna sandwich related sidebar: the tuna + mayo combination that we in North America call "tuna salad" is here generally called "tuna mayonnaise". And it's chicken mayonnaise or prawn (shrimp) mayonnaise as opposed to chicken salad or prawn salad. A sandwich with "salad" in the name here is one with lettuce and sometimes other veggies added. Which, if you think about, actually makes much more sense. After all, what does mayonnaise have to do with salad? 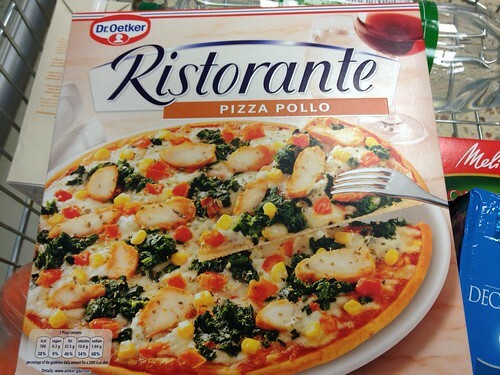 And what Italian chef has ever stood at a counter staring at a partially formed pizza and thought to himself, "Aha! Obviously what this pizza needs is MORE CORN!" Every one us us has probably walked down the street at some point with a slight rumble in the stomach and thought, "Hmmm... What do I want?" Naturally, your first thought is probably, "Where can I get me a cup of corn niblets?" And if that is your first thought, your're clearly some kind of freak and your next thought is probably, "Then for my main course, how about a lightly grilled stoat on a stick? With extra cheese, please." I like to think that I'm pretty well assimilated by now. I've been living in London for two and a half years (!!) and I know how to read a bus map, I know it's a bumbag and definitely not a fannypack, and I can even sing "Jerusalem" without having to hum because I actually know all the words. But still every once in a while I encounter something that makes me feel once again like a stranger in a strange land. That's what happened a few weeks ago when I went out for the evening with my friend Rob to an odd arcade / bowling alley / somethingorother on the south of the river at County Hall. (For those of you trying to keep track of the Robs this was RobW, a relative newcomer, as distinct from RobH, frequent blog commenter and long hair fan, and Uganda Rob, now based in Nairobi. Clear as mud.) They had lots of video games, and old fashioned midway kind of things like those shove-penny machines and shooter games and claw machines and such. They even had coin operated bowling! Weird, but fun. They also had something that immediately caught my eye. 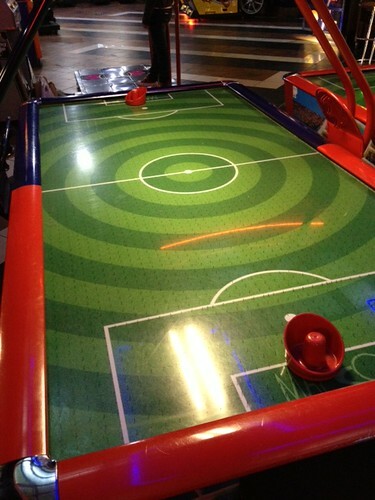 Many of you will be familiar with the game of air hockey. A smooth table with bumpers all around and surface perforated with tiny holes through which air is forced, which makes a round flat plastic puck float on the surface while two player whack away at it unmercifully with a round paddle sort of thing. 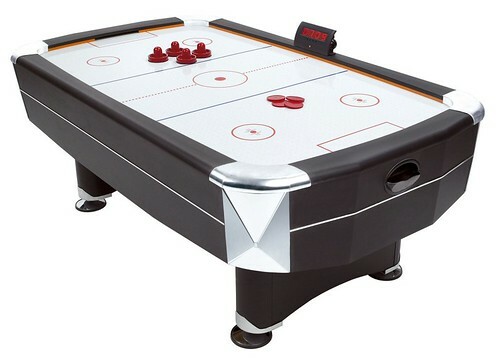 The table surface is painted like a hockey rink with a white background and a centre line, face-off circles, blue lines, goal crease... all the things that make it look like hockey. Good, upstanding, god-fearin' air hockey. I was delighted to discover an air hockey table in the basement of the arcade and happily inserted my pound coin for a quick game. Then I did a double-take and realised, once again, that I really wasn't in Canada anymore. Weird, heathen GREEN air field hockey. What the hell? Air FIELD hockey? They don't even use a PUCK in field hockey! The whole thing must have shaken me up more than I realised because I ended up losing the game 3-2, which I blame entirely on the alien freakishness of the table. Obviously. One of the great things about London is that there is soooooo much going on. Not just music and theatre and museums and such, of which there are boatloads. There are also a ton of slightly off-beat things that crop up pretty much all the time. I've recently subscribed to a daily email sent out by a great website called Londonist (which has the brilliant tag line: London. Londoner. Londonist.) Every morning, by 7:00am, I get an email of a list of the cool things I could do in London that day, lots of which are free free free. One of these emails recently noted that the art installation known as the Rain Room at the Barbican Centre was due to close soon. I had vague memories of being told about this months ago and ignoring it completely, but since it was free, and since I still had a bit of time on my hands, I arranged with a friend to go down one morning in the last week of the installation to see what the fuss was about. 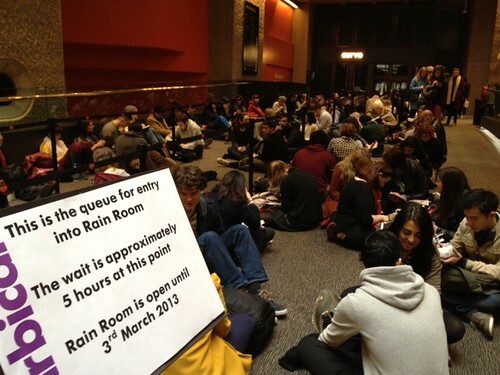 The Londonist warned that queues were getting long, so I reasoned that if we went first thing in the morning and planned to arrive about an hour before the room opened, we'd be fine. Ha! This caught us off guard a bit, but we quickly decided that we weren't going to wait five hours. At least not that day. Before we left Ian cleverly went to the front of the line and asked the people there what time they'd arrived that morning, so we could gauge when to make our second attempt. So it was that we found ourselves settling in, second in line, at just before 8:00am the next morning, for a guaranteed three hour wait. (The gang of girls in front of us arrived at 7:00 and several people got there just after us, so I think we gauged it perfectly.) The wait wasn't that bad. At least we were indoors, on carpet, with ready access to toilets, free wifi and decent coffee. And we had a deck of cards and are both skilled in the dying art of conversation, so the time passed pleasantly. And what was it that we waited so long to see? 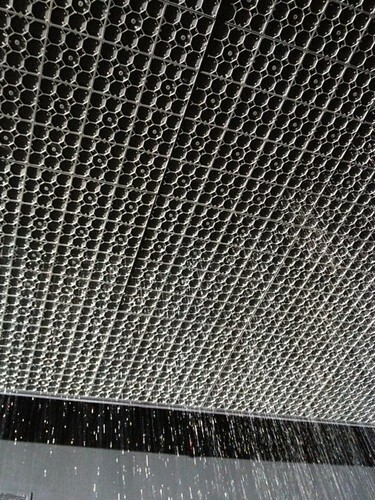 Well, the Rain Room is was an installation of cascading water that visitors were meant to walk through. 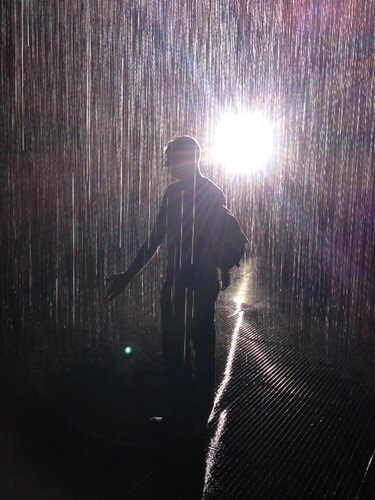 And before you point out the obvious madness of queuing for hours to stand in the rain when London provides ample opportunities for that on almost every day of the week, let me tell you the thing that made the Rain Room so fantastic. The cascade was equipped with an array of sensors that turned the water off in the area in which you were standing, meaning you could walk through the deluge in a little bubble of dryness. Yes, there were occassional drips even when the taps were turned off, and yes you had to move in a slow and deliberate way, but it was still quite a lovely experience. (ARTY PHOTO ALERT!) Ian in the Rain Room. They only let five or six people into the room at once. It was mostly dark except for one bright spotlight, and the only sound was the water and the comments of the other visitors. I loved looking up at the ceiling and then slowly spreading my arms out and watching the waters recede before them. It made one feel a bit like Moses, if the Red Sea had been upside down, and if Moses and the Israelites had had to queue for three hours. The ceiling, showing areas of wet and dry. In the end we spent less than ten minutes in the Rain Room. As cool as the experience was, there's only so much time one can spend not standing in the rain. So we ended up with a ratio of about twenty minutes waiting time for ever one minute of Rain Room time. Still, when we passed by the queue on our way out of the building (after towelling off the stray drips), we felt pretty smug, especially compared to anyone standing next to the "6 Hours from this point" sign. And in other news: work, work, work! My days as an unemployed layabout and full-time café dweller have definitely come to an end for the foreseeable future. As seems to be the nature with freelance work, what started out as an occasional meeting and an infrequent hour or two with a spreadsheet has suddenly become a life filled with phone calls, lists, visits to scene shops, battles with budgets and looming deadlines on two different shows at two different theatres. All of this has been a bit of a shock to the system, but is also a relief and strangely kind of nice. All of this means that my blogging time has been severely curtailed. But fear not! I've got no intention of abandoning you any time soon. But since my weekdays are quite full, weekend have become the best time for blogging, so you should all brace yourself for the advent of Monday morning blog posts (sorry Steve!). And finally, there is some quite interesting employment-related news on the horizon that I'll refrain from announcing until all the specifics are confirmed. But I think it's going to be cool. Scary. Big. And cool. So stay tuned. I've been lucky these last few months. First, Karen and Steve visited over New Year's, and then just last week my old friend Duncan was here for a week doing research for a book. He arrived with a list of things he wanted to do and see, much of which overlapped with things that have been on my own list for some time. This meant that I spent a few days - including one exceptionally jam-packed Sunday - doing interesting touristy things and generally hanging out and catching up, all of which was quite excellent and highly bloggable. First on the list was a trip slightly south and east from Central London to the tiny suburb of Chislehurst. It's a unremarkable little spot on the map notable only for the existence of Chislehurst Caves. (Though perhaps the residents of Chislehurst might protest that their little corner of London is exceptionally wonderful in many other ways. Of course they'd be wrong.) 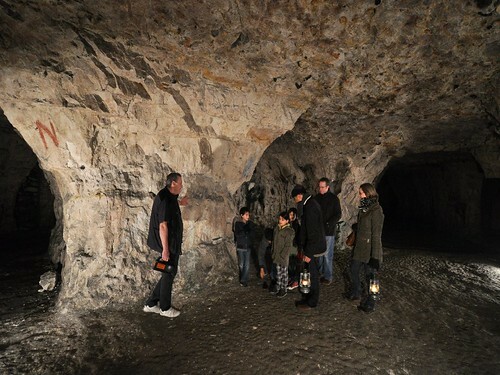 In fact, the site should really be known as Chislehurst Mines because they are not a natural cave system at all but instead a series of man-made tunnels dug into the huge reserves of chalk and flint that surround and support Chislehurst. Chalk has been mined by humans for millennia - it's soft enough that it can be worked with very primitive tools, so even Stone Age societies could dig for it. It's used for the production of lime, which is creating by heating the chalk (who knew?). Lime is the basis of plaster of Paris, is used in cement, and becomes whitewash when mixed with water. And the acidic agricultural fields around Chislehurst were "sweetened" by the application of lime - an alkaline that counteracts the acid in the soil. Flint, which occurs in seams in the chalk was also mined and used to create stone tools, for gunflints and as a building material. The earliest recorded mention of mining at Chislehurst dates back to 1250, so some of the tunnels could be 750 years old. DUNCAN: Excuse me, I also ordered beans on toast. GUY: Oh, yes. Err... I though it was just toast. (interior monologue) ME AND DUNCAN: Even if it was just toast, which it wasn't, you've still patently produced no toast at all, beaned or otherwise. DUNCAN: No, it was beans on toast. GUY: Ah, ok sorry. So did you want beans on that toast? DUNCAN: (spluttering in disbelief and speaking very slowly) YES. BEANS ON TOAST. So as I said, Chislehurst Caves Café is not exactly a centre for excellence in a culinary or customer service sense. However, I digress. Back to the caves. Guided tours are run every hour on the hour, last about 45 minutes, and cost a mere £6. And the caves are a pleasant and constant coolish room temperature, which was quite nice on a cold day. The tunnels themselves are extensive - estimated at about 20 miles in total. 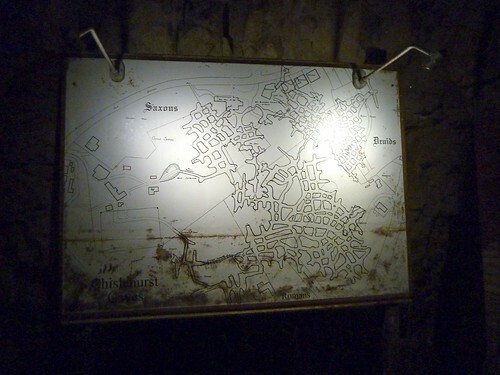 The map of the caves. The areas called "Romans", "Saxons", and "Druids" are names thought to have been assigned by an enthusiastic local resident in the early 20th century and almost certainly have little to do with the actual origins or uses of the tunnels. Chalk and flint mining in the tunnels probably became unprofitable and ceased around the early 19th century, and though the caves enjoyed a brief stint as a storehouse for smugglers, that use stopped by 1840 when heavy taxes on smuggled goods were removed, thus also removing the smugglers. 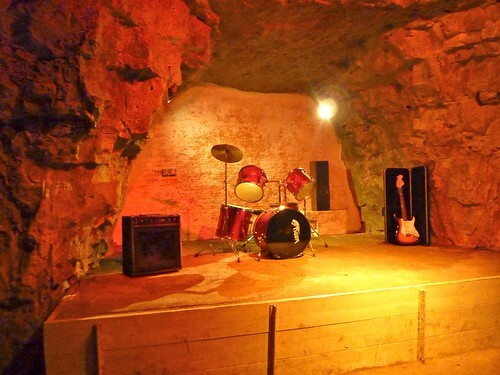 The caves first became a tourist attraction in the Edwardian era, but with the start of World War I they were turned into an ammunition depot for the overflow from Woolwich Arsenal. 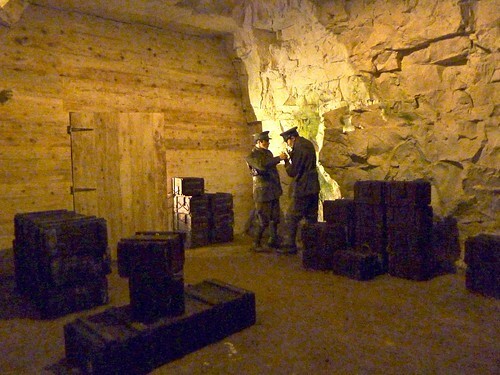 A recreation of an ammunition storage area in the caves. There were quite a few tableaux like this which were not badly done, especially considering that I think they were all created by the family who own and run the caves. 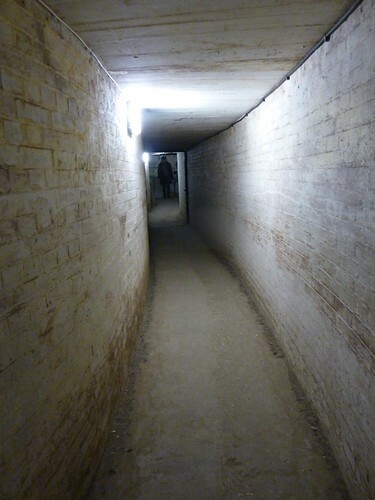 More interesting though was the use of the tunnels during the Second World War as a massive bomb shelter. The government initially discouraged people from sheltering underground during bombing raids for fear that they might simply refuse to leave. Ever. Despite this, within days of the start of the Battle of Britain in early September of 1940 people were arriving at the caves by the thousands. At first facilities were rudimentary - people slept on the floor of the caves and had only candles, torches and oil lamps for light. But, in the true war time spirit it only took a few weeks for there to be a functioning underground society complete with electric lighting, ventilation and sanitation. Bunk beds were installed and people could doss for a penny a night or sixpence a week, as long as they followed the posted rules. Eventually the caves sheletered more than 15,000 people, who enjoyed ammenities such as a fully staffed medical centre, hair salon, church and two different cinemas. The caves even had their own Brownie, Guide and Scout groups. 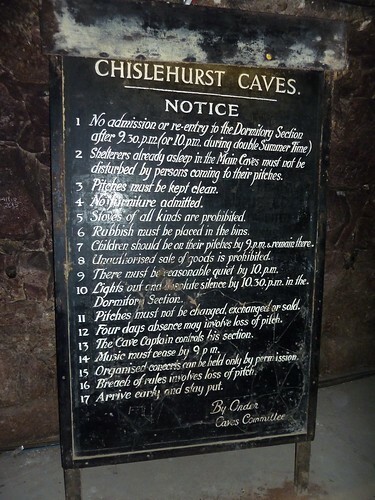 People remained resident at Chislehurst caves for close to five years because even after the end of hostilities many had nowhere to return to. 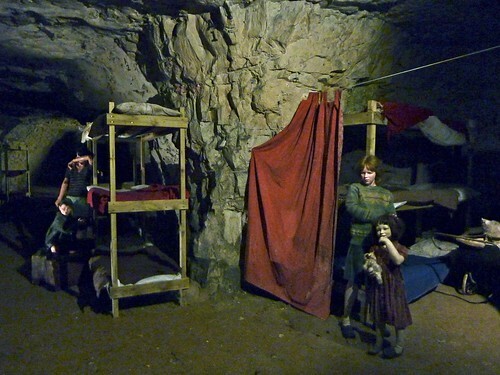 And, in the entire time the caves were used as wartime shelter, only two people died (and not due to enemy action). 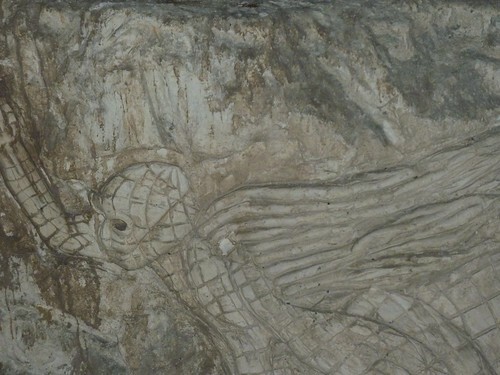 Even a direct bombing hit on the caves was barely noticed by those below, causing only a flicker in the lights and a dusting of chalk from the ceiling. There was even a baby girl was born in the shelter who, lamentably but perhaps inevitably, was given the middle name "Cavena". One of the live music stages. There were also dancefloors. Of course there are ghost stories that go along with the caves too, many of which centre around a "£5 Challenge" daring anyone to spend a night alone in the caves and claim their money. Apparently, despite several attempts, and at least one seizure and evacuation by ambulance, the prize was never claimed. Now the owners allow people to use parts of the complex for live role playing games like Dungeons & Dragons, which sounds like it would be immensely fun and cool, in a supremely geeky way. Wandering through the caves was really quite evocative and creepy at times. Cleverly, the people in charge do not allow you to use flashlights - only the guide is equipped with one. 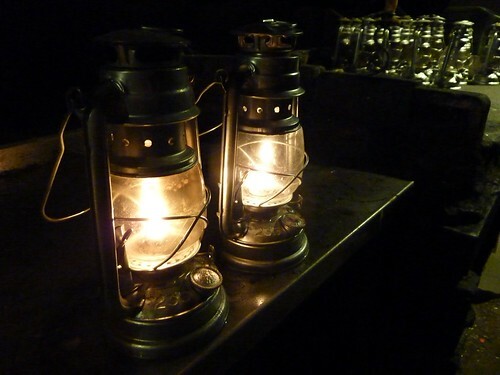 Instead visitors are invited to carry oil-fuelled miner's lamps, which adds immeasurably to the atmosphere. Once or twice Duncan and I ended up dawdling a bit behind the main group and it didn't take long before they'd disppear completely down a side passage. Those miner's lamps don't throw a great distance, so it was easy to be left almost completely in the dark with the muttering sounds of the rest of the group fading quickly. It was a powerful incentive to speed the hell up. The table of lighted lamps at the entrance to the main tunnels. 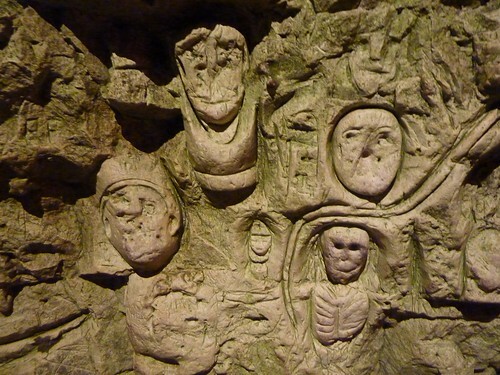 And because the chalk walls of the caves are so soft there are lots of carvings people have created, some small and primitive, others large and remarkably elaborate. And of course this is Spider-Man. No, really, it's Spider-Man. 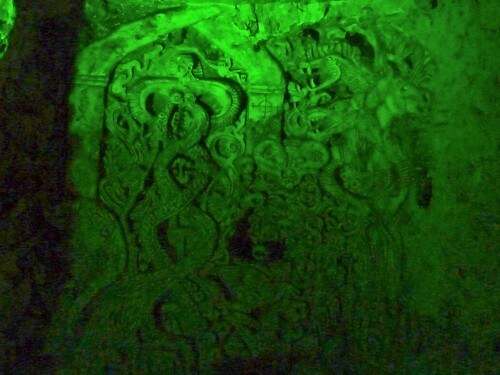 Not all the carvings are antiques. The tunnel system really is extensive and labyrinthine; we saw just a tiny portion of it. (During the war years, to aid in navigation, the tunnels had names like street names - including the evocative "Lumbago Alley" One assumes the ceiling there must have been quite low.) We ended up back at our starting point after about 45 minutes of walking, and during that time we only covered about a mile so; it would take years to become really familiar with all the nooks and crannies. I tarried a bit at the end in order to get a few more photos and ended up being the last one out. This is Duncan, returning through the long access hallway to retrieve me. Or perhaps to loot my body for cash and small electronics. I'd say Chislehurst Caves was definitely worth the trip. It was interesting and quirky and atmospheric and thoroughly enjoyable. It was even reasonably priced and easy to get to so really it ticks all the boxes for an excellent Day Out. Except, perhaps, the box labelled "beans on toast". P.S. I should really mention this more often, but as with most blog posts, you can head over to my Flickr page and see the photos that didn't make it into this post, but may be mildly diverting now that you've read the blog. Unsurprisingly, photos from today's post are in a set called "Chislehurst Caves"